The Neighborhood Fruit Tree Planting in conjunction with the La Casa Youth Engagement Grant is really starting to blossom! We still need one more youth leader. Laura Bruno, who lives in the Historic Southside Neighborhood of Goshen, is seeking youth and adults in the Historic Southside and Parkside neighborhoods who have interest in helping create an urban food forest in Goshen. I’ve been meeting with Julia King of LaCasa Inc. and Becky Hershberger (the point person for the 9th Street corridor renovation). LaCasa currently has two youth engagement grants available for $1,000 each. I’d like to explore the possibility of using at least one of the grants to plant fruit and nut trees around the perimeter of Water Tower Park, just south of Plymouth on 9th St.
I’m putting out a call for anyone who knows any youths at all interested in gardening, community service, food forests, college application/resume building, or just improving the neighborhood and meeting like-minded people — please let them know about this opportunity and find a way to connect with them. The grant(s) require that at least two youths (aged 15-20) be significantly involved in leadership roles, and the grant must focus on neighborhood connection, improvement and involvement. 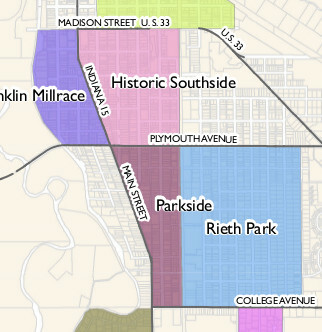 It would make sense to focus this grant on the Historic Southside and Parkside neighborhoods if the project is located at Water Tower Park. The youth need to show how all the $1,000 would be spent, so if there’s extra money, it could either need to go to raised beds or some other project expansion or photography exhibit, or even a big party. Anyway, if there are enough neighbors interested in helping to make an Urban Food Forest in Goshen a reality, we could do it this Fall. We just need some youth to step into positions of leadership and influence the decision making process. Please let me know if you have any ideas or contacts. We will need minds to plan what kinds of trees and their relative location, as well as the possibility of permaculture guilds around the trees. Do you know anyone in these two neighborhoods with this kind of knowledge and interest? This entry was posted in community, food and tagged headlines by Ben Beyeler. Bookmark the permalink.